They're cheaper, require less spending by cities than on cars, and are often faster. Expect ever-more bicyclists in Milwaukee. 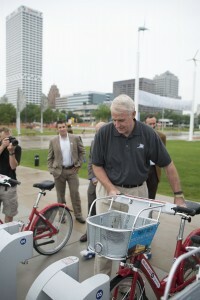 Milwaukee Mayor Tom Barrett checks out a Milwaukee B-cycle bike from the new kiosk at Discovery World Museum on the Lakefront. 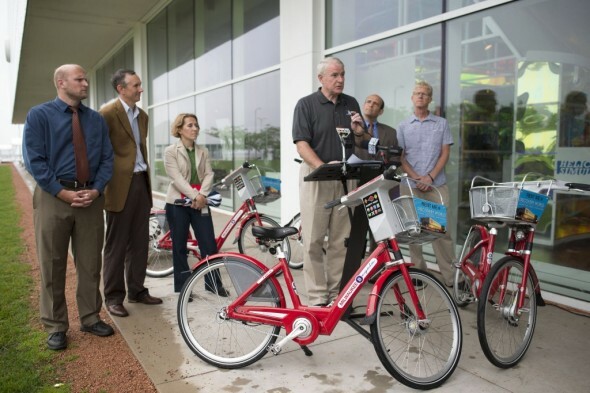 On Monday morning Milwaukee Mayor Tom Barrett teamed up with Midwest Bikeshare, Inc., to announce the opening of Milwaukee’s first B-cycle kiosk. Mayor Barrett upped the ante not only by confirming the City will commit $288,000 toward Milwaukee bike-share system, but by announcing there will be 23 more stations open by March, 2014. I know, I know, we shouldn’t run out and chisel that date in granite, or even cream city brick, but this announcement did come with the opening of the first functioning bike-share kiosk in Milwaukee. Perhaps even more important than the first station or even the money is having a mayor who is a true champion of bike-share in Milwaukee. This milestone is just another indicator that even in my much-loved, but sometimes slow-to-accept change, home town, bicycles really are on the rise as a legitimate form of transportation. Bicycles are such a good fit in urban areas and offer a simple, low-cost, singular solution to so many complex problems, that market forces and momentum should be enough to ensure their near-future position as a mainstream mode of transportation. Mayor Barrett at the media conference for the opening of the Milwaukee B-cycle kiosk at Discovery World. Behind the mayor are Alderman Kovac, Kevin Hardman-Launch Director for Midwest Bikeshare, Kristen Bennett-Milwaukee Bike/Ped Coordinator, Bruce Keyes and Barry Mainwood-both of Midwest Bikeshare. Inexpensive, efficient, convenient and fast, bicycles meet every test of a great transportation system. Compared to cars, bikes are CHEAP to buy and maintain. Compared to freeways and roads, bike lanes and trails are INEXPENSIVE to build and maintain. In dense, urban areas where most trips are less than a few miles, bikes are often the FASTEST way from point A to B when parking is factored in. Given the current politics of cutting taxes and reducing government subsidies, it would be hard to imagine a future that does not include bicycles. Don’t get me wrong, I won’t be riding my Schlick Northpaw up to Ashland County to go deer hunting this fall, and I don’t expect others will either, but I do expect the growth in people riding bicycles for transportation to continue. It is great hear Mayor Barrett recognize how well bikes fit the “heart of a city.” With leadership like that, Milwaukee B-cycle can’t help but succeed and add to cycling’s momentum. Will those bikes have snow tires in the winter? As with the Madison and Twin Cities bike-share systems, a Milwaukee program would likely shut down in November and re-open in March or April. That is the general model. As an aside, while I ride with studded bicycle tires on my commuter bike in the winter, my wife prefers not to. She jokes I’m the only stud she needs. I’ll add that I bike year round as well… And have pretty standard tires on my Trek and I get around fine. I, too, will testify to riding my bike all year round… riding in the winter isn’t nearly as difficult as people seem to think it is. Normal bike tires on city streets usually hold up just fine– you have to be careful to go slowly in slippery and wet spots, and disc brakes are very helpful to stop in wet weather, but there’s absolutely no reason people shouldn’t be biking in the winter as well as summer. chalk up another one who commutes year round. I actually prefer the brisk winter weather to the sultry days we have coming up. The only specialized gear I have isn’t any different than most proud Wisconsinites don’t already have to enjoy the outdoors.